Generic Company Place Holder Another Monster at the End of This Book...Starring Grover & Elmo! With the exception of The Godfather, Part II, and the 1996-97 Chicago Bulls, sequels rarely live up to their predecessors. Sadly, that’s the case with Callaway Digital Arts’s follow-up to the delightful iOS adaptation of The Monster at the End of This Book. Another Monster at the End of This Book has its moments, but in its present form, it’s a case of one monster too many. As in the first ebook—an iPhone and iPad version of the Little Golden Books classic—Another Monster at the End of This Book stars Grover, still fretting about the imagined dangers waiting for him and the reader on the last page. This time, however, Elmo is also along for the ride. In the interest of full disclosure, I was raised on Sesame Street in the 1970s, but I have always found Elmo’s appeal… elusive. Merchandise sales, media appearances, and global affection indicate I am on the wrong side of history here, but Elmo—whose role here is to urge readers to push past their fears and go find that monster at the end of the book—doesn’t add much to my enjoyment of the tale. Still, the problem with this Monster adaptation isn’t Elmo—it’s the responsiveness of the 1.1 version of the app. One of the great things about the first Monster at the End of This Book app was its interactivity: Tap Grover and select objects on the screen, and you’ll get a response from the lovable, furry muppet. That interactivity is also on display in Another Monster—in fact, it’s even more abundent as you have more words and objects to tap. Tap on the highlighted word “Elmo,” for example, and Elmo will spell his name for you, inviting you to spell yours. It’s one of Another Monster’s stronger features. Monster Mash-Up: Another Monster at the End of This Book offers plenty of interactive opportunities for you and your kids. 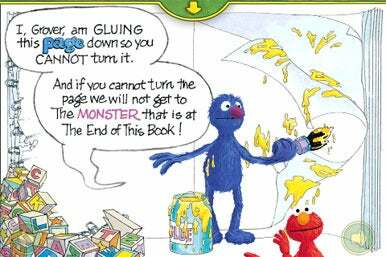 Tapping ‘page” or ‘monster’ will make either Grover or Elmo talk back to you, and you can also use your finger to wipe away all that glue Grover is spreading on the page. The trouble is, there’s usually a lag between when you tap something on the screen, and when it interacts with you. When I tapped either Elmo or Grover to get them to talk to me, they would do so, but often after a noticeable delay. Other activities—knocking down a castle of blocks set up by Grover to stop you from turning pages, say—will cut off dialogue, which can be frustrating for young readers. My daughter is a little on the young side to take full advantage of the two Monster books for iOS devices. (Reading the stories is Dad’s job, anyhow.) But she absolutely lights up whenever I launch the original Monster at the End of This Book—smiling the first time Grover appears on the screen, applauding at the end of the story, and tapping objects when prompted by the app. Her reaction to Another Monster at the End of This Book is more subdued: It holds her interest, but it doesn’t engage her in the same way that the original continues to do. Which is not to say Another Monster at the End of This Book is a bad app. You have the option of either helping Grover block any progress toward reaching the end of the book or doing Elmo’s bidding to get past Grover’s obstacles, which is a fun thing for kids. As for performance lags, Callaway has a good track record of taking these things very seriously. The original Monster at the End of This Book hit the App Store in 2010 in far worse shape then its sequel; the developer worked very hard to improve that ebook. I wouldn’t be surprised to see future updates to Another Monster take care of any performance issues. If, like me, you grew up reading the original Monster at the End of This Book, you may believe that Another Monster has an awful lot to live up to. Viewed on its own terms, though, Another Monster at the End of This Book is a perfectly acceptable story. With a few minor tweaks, the app could become a welcome addition to your kids’ iOS reading list—even with Elmo.